Tulum is situated on the most pristine beaches in the world, but for the explorers who may need a break from the Caribbean beach, this Mexican nirvana on the Yucatan peninsula offers many excursions OFF the beach that include more than shopping for trendy Boho dresses and Mexican wares. 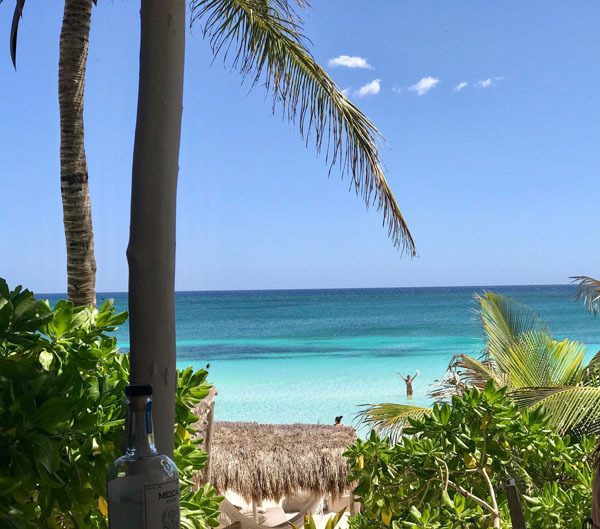 After you’ve spent time relaxing and getting as lazy as possible on the beach, and you’ve snorkeled right off the beach or scuba dived to view the brightly colored tropical fish (or even tried kite surfing, which is popular with the strong winds), it may be time to see what else Tulum has to offer. For the adventurous, there are more than 5,000 freshwater cenotes (650 open to the public) to explore, and although Sac Actun came highly recommended due to less crowds, we crawled down into the private Muul Ich, a cavernous closed cenote with only a dangling light to swim inside this sinkhole filled with glacier water along with bats, limestone stalactites, and catfish. 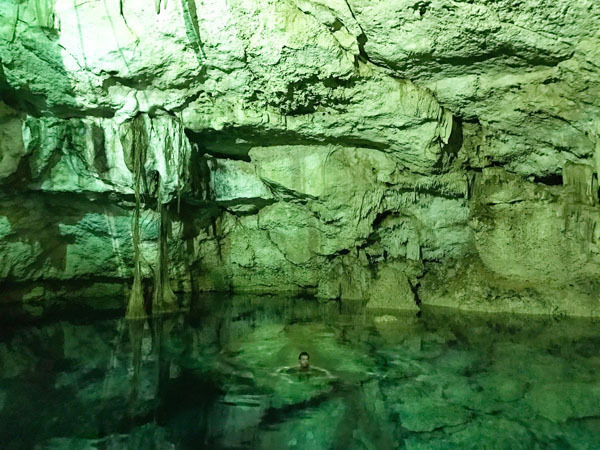 Our extremely informative and well-educated guide Alberto Cuellar with Azulik Hotels Mystikal Wanders program (Alberto.cuellar08@gmail.com) was the only reason we found this private cenote. 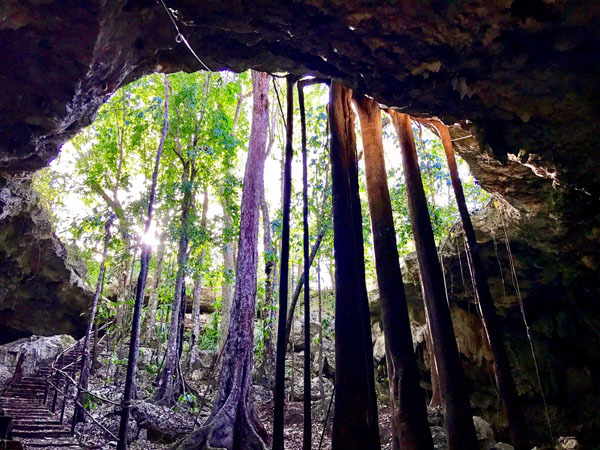 He later took us to another private cenote nearby with climbing dripping trees that busted through the limestone rock to get to the water. Nature is wild! This place half underground felt spiritual, and to my surprise, people tie the knot here. One of the major highlights of our trip to Tulum was climbing the 137 foot pyramid, Coba in an ancient Mayan city, and if it wasn’t for Alberto we would have never found the place, let alone learned a plethora of knowledge about the area and Mayan history related to the ruins. By bike we pedaled through the jungle to climb the tallest pyramid in the Mayan world, Coba. 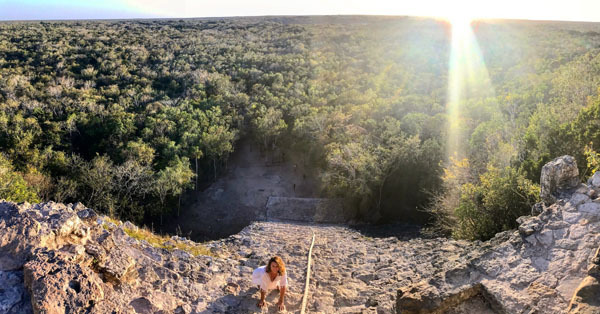 Terrified of heights, crawling up Coba’s steep jagged rocks at sunset was breathtaking, elevating us high over the jungle with an ethereal glow, and not a tourist in site! Sian Ka’an Biosphere, a UNESCO World Heritage Site (1.3 million acre nature reserve) is just a short drive away from Tulum’s hotels. Informative Alberto Mena with Mexico Kan Tours (www.mexicokantours.com) picked us up at our hotel for a half day tour ($110 per person) and enlightened us with Mayan history. From the archeological site of Muyil, an ancient Mayan trading post, we crossed two lagoons by boat to float for about 30 minutes through a crystal clear canal the Maya dug thousands of years ago surrounded by mangroves, orchids, bromeliads, and cacti. 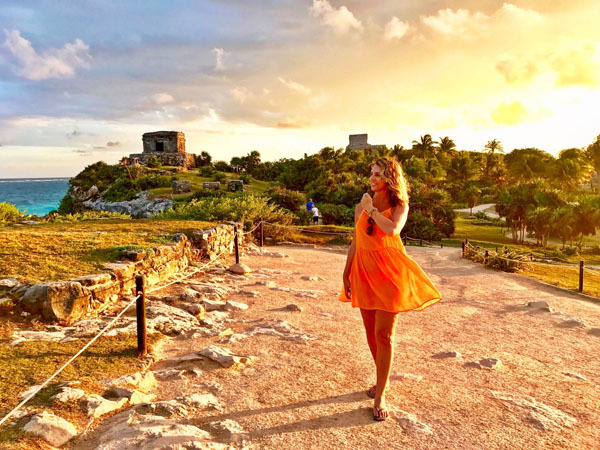 Don’t miss taking a short cab ride to the Tulum Mayan ruins, a walled city set atop a cliff by the Caribbean Sea where we shared a powerful sunset with iguanas. Sunrise is apparently the best time to visit with a post dip in the ocean, but there were little visitors at sunset, and the sun glow against the ancient ruins mesmerized us. And after all your adventures, unwind with a 70 minute massage on the beach for around $40. We saw these massage bed areas being offered in several locations. If shopping is still on your mind, we recommend going in town (the city) to score better deals on souvenirs, like honey from the melipona bees, hammocks, dream catchers, and Mexican style dresses or tops. Our favorite shop discovery for gorgeous leather crafted shoes for men and women is AVF Artesanos (Instagram at @avf_artesanos). You may love the stylish shoes with tassels perfect for a casual or dressed up look.